Chanel Allure Homme is a luxury fragrance, full of life designed for real men. Chanel Allure Homme 100ml. Eau De Toilette is a masculine scent spicy and full of life designed for real men. This is a luxury fragrance, the quality that radiates sensuality and energy. Perfume composition is carefully selected, the data agreements fragrance notes of bergamot Calabrian, Sicilian mandarin and pink pepper from Madagascar, these notes giving it a unique flavor perfume, original. 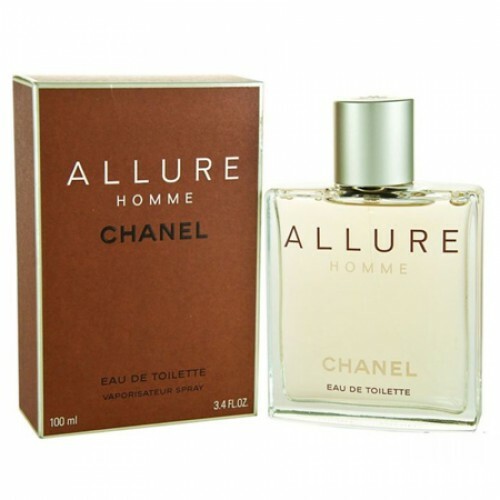 The fragrance Chanel Allure Homme is a natural fragrance, fresh, lasting which is appreciated by all ages. Released in 1998, Allure Homme by Chanel won the favor of men of all ages. Fresh oriental-woody fragrance is a masculine charisma and masculine character, enclosed in a bottle. Chanel perfumer Jacques Polge created male Allure Homme four "faces": fresh, woody, spicy and sensual. Allure Homme begins notes of citrus and becomes warm "heart" of spices and wood. Sensual fragrance bottle placed in a rectangular shade of "champagne" - a simple and courageous. Doubles fragrance - feminine Allure. It is attractive but frivolous. Fragrance created of four main lines: green freshness, warm sharpness of pepper, strength and elegance of wood, warm and sensual labdanum and tonka. None of these major trends can be felt individually, together they create a harmonious whole. This sensual and delicate eau de toilette, which is the embodiment of refined style famous brand Chanel, who decided to express by means of spirits. It is positioned as a classic fragrance, perfume composition of which is created from the 4 main fragrant lines: elegance and wood strength, green fresh chili pepper, tonka bean and warm sensual labdanum. This sound is of particular appeal and sensuality, virility and attractiveness.